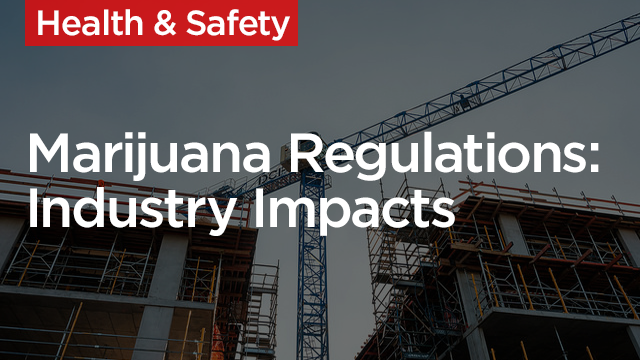 More states are now legalizing marijuana, which presents new risks for contractors in a world where simple evidence of an employee’s cannabis use in those states no longer crosses the line. Companies are facing questions ranging from how to reshape drug-use policies and protocols—some of whose old structures now may be unenforceable or even illegal—but also revisions to employment contracts and employee manuals. Legal, safety and human resources experts from contracting firms will explain how they are retooling policies to keep job sites drug free, while avoiding potentially costly legal challenges. Familiarize yourself with the laws and regulations surrounding Marijuana on both the state and federal levels. Learn the possible hazards of adopting and enforcing zero-tolerance drug-use policies. Discover the potential impacts of stricter drug-use policies on recruiting and retention. Learn best practices for drug testing and how to keep your employees safe and drug-free on the job site. President, Red Planet Substance Abuse Testing Inc.